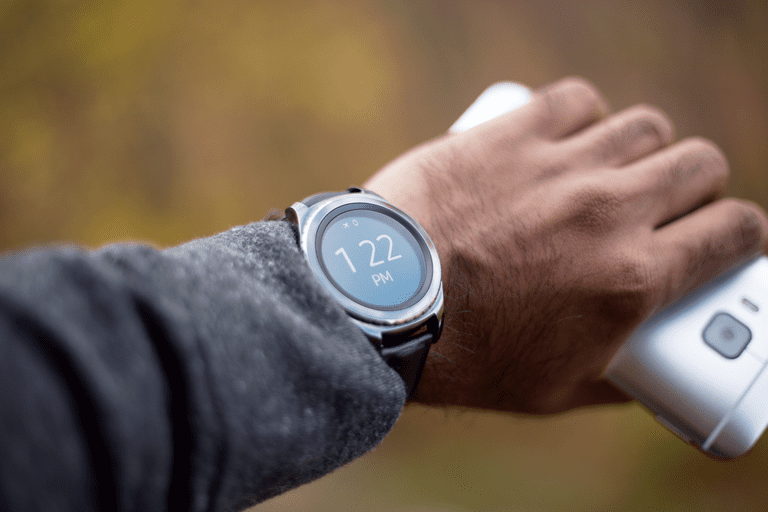 The Samsung Gear S2 may not be latest generation smartwatch, but there are still plenty of watch faces available that can make it feel like you have the coolest watch around. Installing any of these watch faces on your Gear S2 is simple. Just download the Samsung Gear app for your iPhone or Android. If your watch is powered on and bluetooth paired with the phone, the phone will scan and recognize it. Sync your phone with the watch using the app, and you're ready to start uploading watch faces to your watch. Dual digital and analog display. Limited to one color scheme. If you're the kind of person who struggles with deciding between an analog or a digital watch face, the free Xenon Gear watch face gives you the best of both worlds. The red hands combined with the white numerals against a black background make the important data pop against the black background. Tapping the steps on the display takes you to your steps history. Tapping the battery side takes you to the battery status. The Xenon Gear watch face combines just enough class with functionality that it'll turn heads, while also being useful in your everyday life. If you're looking for something a little bit different for a watch face, and you're a fan of the Peanuts comic strip, the free Snoopy watch face is a good choice. The watch face shows Snoopy and his sidekick, Woodstock, sitting on top of Snoopy's dog house and looking at each other. This watch face isn't overflowing with features, but it does what a watch needs to do. You'll see the date at the top, and the time in red right below it. You'll also see your daily step count in black on the side of Snoopy's doghouse, and your current battery level in the center of the screen. It's everything you need at a glance, with the added bonus that every time you look at your Gear S2 watch face you're guaranteed to smile. Simply named "Photo Watch", this free watch face is ideal if you find the perfect watch face for your Samsung Gear S2. You can use any photo as the background. The process of changing the watch face background is very simple. Pair your phone to your Gear S2 via bluetooth. In the Samsung Gear app, tap on Settings. Tap Transfer content to Gear. Choose the photos you want to transfer to your watch, and tap Done. On your Gear S2, double-tap the Photo Watch watch face. Tap photos at the bottom of the watch face. Scroll to the photo you want as your watch face and select it. The Photo Watch watch face lets you customize your watch so that it looks exactly the way you want. Tap the bottom of the screen for the digital time and battery level. There aren't many features, but being able to design your own watch face is a fair trade-off. May be too flowery for some users. Not a free watch face. If you feel like most watch faces in the Samsung Gear market are too masculine, you'll appreciate the Lady Summer watch face. There are two things you'll notice immediately about this watch face. The first is that it's beautiful, with with a tasteful floral pattern all around the edges. The second is how much information you can see in such a small space. You'll also notice other icons scattered around the watch face. Tap the sun and clouds to see the weather. Tap the music note to open the music app. Tap the leaves icon to change the color scheme. It's a nice watch face that'll suit the tastes of many users. It's not free, but only costs 99 cents to use. And if you need it to match your outfit, just tap the leaf icon to switch the watch face to a more coordinated color! While the free Lifesum Gear 2 watch face looks like the perfect watch face for children (and it is), it's plenty of fun for adults too. This watch face is all about health. A cute, animated cartoon character lives at the bottom of the face. Every time you check the time, you'll see your Lifesum budy active doing something that he thinks you should be doing to be healthy. You can tap any of these data points to access your Gear S2's health dashboard. Just remember to glance at your Lifesum friend at the bottom of the screen for a reminder of what you should be doing right now to stay healthy. The Paris Toujours classic watch face isn't flashy or stuffed full of features. But what it does do, it does well. It's a stylish, classy watch face that'll catch the eye of everyone around you every time you check the time. The watch face displays the Eiffel Tower front and center, stretching from 12 o'clock all the way down to 6 o'clock. All around the watch face you'll see vintage parisian artwork and font, with the word "PARIS" at the very top of the face. The only digital number you'll see on the display is today's date. There's no animation or anything to tap for more information on this watch face. But the beautiful style and antique motif is enough to make it well worth the very low 88 cent price. Why search through your watch for different health stats when you can have them all displayed on a single, futuristic watch face? What gives the face its futuristic look are the three colored rings around the outer edge that visually display time, hour, minute, and second. If you love cities, the Around the World watch face is a great way to show your urban passion. It costs one dollar, but for an animated watch face it's a great deal. The watch face only displays current date, time, and battery level. But what makes it stand out is the antimated landscape that slowly circles the outer edge of the watch. The entire outer landscape slowly circles around the dark center circle. It gives the appearance of the rotation of the Earth itself. In the sky above the landscape, you'll see aircraft and clouds moving quickly over every city. Owning a smartwatch means you get much more than a simple timepiece. Any of the watch faces listed here will transform your watch into a work of art, or a flashy watch face that will make you glad you invested in a smartwatch in the first place.